For a while I’ve had a notion to set the record straight about the Argyll Turbo GT – I’ve collected a certain amount of published information from various stages of the car’s evolution starting with a road test of the first Rover V8 engined prototype in the September 1976 issue of CAR. The information available online comprises some rather lightweight and contradictory web articles, which hinder rather than help understanding. I decided that learning more could be a worthwhile project – I had the advantage of being based less than a hundred miles down the road from the Argyll’s unlikely home in Lochgilphead, on a fiord off Loch Fyne. On my first available free Monday, I set off for Tayvallich, a yachting haven and lobster fishing village on a narrow neck of land between Loch Sween and the Sound of Jura given on a website as the address of the Minnow Fish Carburettor company. Having taken in the scenery and a good meal I made local enquiries about the whereabouts of Minnow House and learned a quick lesson about the reliability of website information. 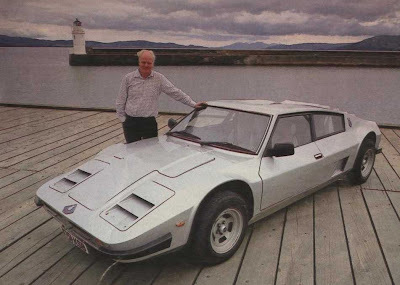 A call from the post office phone (Tayvallich may be less than 100 miles from Glasgow, but it remains a stranger to mobile communications…) and I'm speaking to Bob Henderson himself, turbocharging guru, developer of the Minnow-Fish carburettor and creator of the Argyll Turbo GT. Enquiring as to his whereabouts, I was told "where we’ve always been". Lochgilphead, , is only ten miles away – I was off down the road as quickly as is prudent on single-track roads at the height of the tourist season. Bob Henderson appeared from behind his XK120, parked in the Minnow House yard, with a variety of other interesting machinery – a Nissan Pulsar GT-R, a Rover P4 105R, and several ‘proper’ Saab 900 Turbos. I had arrived at a good time. Minnow Fish’s dynamometer was being recalibrated, necessitating a break in the workload. It was an absolute privilege to spend an afternoon with a true automotive and engineering luminary. Subjects discussed included the BMC A Series and Jaguar XK engines, his previous career as Chief Engineer of Short Aviation, the Highlands and Islands Development Board, colonial Malaya, Jaguar under Leyland, Lord Stokes (A Henderson villain! ), the relative importance of thermal and volumetric efficiency, and, just occasionally, Argylls. I’d arrived just slightly too early to see a road-going Argyll. The silver example owned by Andrew Smith, former Scottish autocross champion and partner in the original venture, would shortly be readied for a return to the road, after about ten years’ "rest" as an exhibit in the Scottish Motoring Heritage Centre in Alexandria. Even in a dark corner of the rambling former laundry which has been Minnow Fish’s base for over 35 years, the striking proportions and clever design features, such as the "optical trough" for rear vision, and the ingenious fixed louvred headlights, were clearly evident. Despite its development in the forests of Argyll and rally stages in the Grampians, this is no Stratos-like compact rally weapon. It is, instead, a generously proportioned grand tourer, with a longitudinally mounted V6 engine and 2+2 seating accommodated with in its 3.0 metre wheelbase. Other key dimensions are: length – 4674mm, width – 1826mm, height 1220mm, front and rear tracks – 1575mm. Several examples of the chassis were available for inspection, a complex "bird-cage" fabrication of box sections and square and hollow tubes, rigorously triangulated and braced, and possibly owing more to the Clyde shipyards than the "add lightness" philosophy of Colin Chapman. The weight of the completed cars was around 30 cwt (1500kg). Not particularly heavy by the standards of today’s bloated hatchbacks, but comparable with the Rover SD1 and Ford Granada of the late ‘70s. The reason for the over-engineering was a design intent for the cars to last 20-30 years – "protecting the initial investment of the discerning" is how the 1983 sales brochure puts it. Suspension is by double wishbones all round, the rear system following racing practice with wide-based purpose built wishbones and the facility for adjustment of the geometry which never required to be used. At the front there’s a modified proprietary subframe with rack and pinion steering. Bob Henderson is occasionally given to mischievous reticence and wouldn’t reveal its origins, but my guess is Granada. In the Argyll’s various iterations the spare wheel and fuel tank positions were varied to achieve as near to a perfect 50/50 weight distribution as feasible. The steering column is from a Dolomite, the Marina door handles of the prototype gave way to Volvo fitments, the instrumentation is from the same source. That windscreen is another Henderson Guessing Game – mine is Cortina Mk. 4. The 1976 CAR article, by one Jim Dunn, praised the turbocharged Rover-engined prototype’s performance, its controllability, neutral handling and unexpectedly comfortable ride, but the interior trim was described as "virtually non-existent…Henderson wants the customers to have them detailed to their own requirements elsewhere". In the years which followed Avon Coachwork of Leamington Spa were engaged to produce a suitably luxurious interior. The use of Scottish leather partly compensated for this being one of the few areas of specialist input sourced outside west-central Scotland. As a matter of record, the CAR article refers to a Saab engine option, also turbocharged, but none was ever made. In 1976, this would have been a turbocharged Saab engine, not a Saab Turbo engine, production examples of which were still over a year away. Henderson has been prescient throughout his career – his 1974 book "Theory and practice of turbocharging and supercharging" appears to have been the first generally published work on turbocharging written outwith the United States. In October 1983, an official launch for the Argyll Turbo GT took place at Inveraray Castle. A number of advance orders were already in place, production capacity was stated at 12 cars per year, and the first customer car was being readied for delivery. A price range of £25,000 to £30,000 was quoted. At that time a Lotus Esprit Turbo cost £18,913, a Porsche 911 Carrera £21,464, and a Ferrari 308GTB quattrovalvole £26,181. The production car remained close in principle to the 1976 prototype, the major change being the adoption of a blueprinted and turbocharged version of the Douvrin V6 from the Renault 30, along with its own transaxle, as the core engine, and refinement of internal and external detailing. The sales brochure lists an alternative 3.5 – 4.2 litre turbocharged ohv V8, no manufacturer is named but it was clearly Rover-derived. In this specification the ZF transaxle, shared with the Maserati Bora and De Tomaso Pantera would be used and the rear seating was omitted. Bob Henderson told me at the outset that the two things he never discusses are power outputs and production numbers. I fully respect his reticence on this - no published article I’ve read, including Richard Bremner’s 1984 ‘Motor’ cover story has manged to extricate any more infomation. What is certain is that a steady flow of Argylls left Minnow House over the following seven or eight years. No Rover or Saab-engined customer cars were ever produced, but some were made with a Minnow-turbocharged Lancia Beta engine and transmission in place of the Douvrin powertrain. The most intriguing development came when Argyll managed to secure a small batch of Buick V6 based engines, intended for Indy Car racing but never fielded in competition. With specially cast "Argyll Turbo GT" cam covers, and extensive re-working for road use, these engines were used in a small run of production cars, once again using the ZF transaxle, while providing 2+2 seating, albeit rather diminished by the space for the bulkier power unit. According to a 1989 Sunday Times article there were plans to set up production of an American export version with the figure of 250 cars per annum quoted. Compliance with US regulations was certainly achieved, with relatively few modifications beyond the new powertrain, and I am aware of one car in the US, although contact with the owner has as yet eluded me. And the final Argyll? It could be yet to come. Bob Henderson’s to do-list includes completing the final Indy-engined car, its chassis presently sitting in the workshop. He hints at the possibility of further cars – the production infrastructure remains largely in place and the latent demand exists. I said my farewells, and made my way down the A83, trying in my mind to sum up this enigmatic and idiosyncratic car. I’d hoped to identify some production numbers and a timeline, but it was clear that this information was going to remain with the Argyll’s creator. What I had gained was a clearer definition of the designer’s intent. To label the Argyll as a Caledonian Ferrari or Porsche is crass and lazy. The Argyll design is instead a very personal car, the physical embodiment of ideas long held by its creator, based on sound engineering principles, refined in competition and enhanced by ingenuity throughout its development process. Production projections were always modest, and the 1983 launch coverage reported that "Astonishingly, the entire project has been privately financed, and has been neither aided nor funded by the Highlands and Islands Development Board, or any other government agency to date". Bob Henderson had earlier that day noted with pride that this remained the case. There is a far more apposite parallel, close to home than Modena or Zuffenhausen. Consider the designer’s aeronautical engineering background, the uncompromised application of well-understood engineering and aerodynamic principles, the disregard for fashion or change for change’s sake, and the ingenious use of proprietary components. Look beyond its mid-engined configuration, and the Argyll could perhaps be described as Scotland’s Bristol.